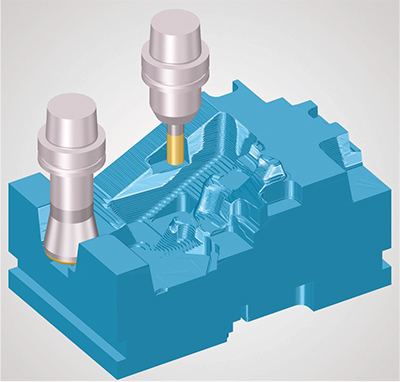 Tebis America, Troy, MI, has launched Version 4.0 Release 2 of its CAD/CAM software, especially well-suited to the rough machining of deep cavities and for hard-material machining. During roughing, the depth of cut and the best utilization of cutting data ensure fast and cost-effective manufacturing while keeping tool costs low. The tool path automatically adapts to the geometry without full-width machining. The integrated re-roughing counteracts the formation of larger steps in steep boundary areas. These areas can be machined from bottom to top with a smaller depth of cut.